Marriot's BeachPlace Towers, beach resort home in Ft. Lauderdale. A vacation home that feels like home.Overlooking the Atlantic Ocean and Intracoastal Waterway, Marriott's BeachPlace Towers is steps away from the glorious sands of Fort Lauderdale Beach. Relax at our outdoor pool and take in the beautiful views of the Atlantic Ocean. Enjoy the convenience of the Splash pool bar. Open living and dining areas with elegant, comfortable furnishings. Fully equipped kitchen. Televisions throughout, DVD player in living area. Master suite with king-size bed, oversize soaking tub, separate shower. Spacious, fully furnished private balconies and porches. In-villa washer and dryer. 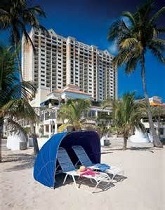 Experience a destination for all ages Marriot BeachPlace Towers Rental in Ft. Lauderdale FL.